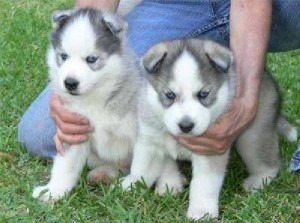 A beautiful litter of chunky KC registered Husky puppies for adoption. Puppies have been vet checked and will be wormed and flead before they are able to leave. We have three boys and three girls with colors of light brown and white , and wolf grey and white. Puppies will be fed on high quality puppy food and will come with a puppy pack.